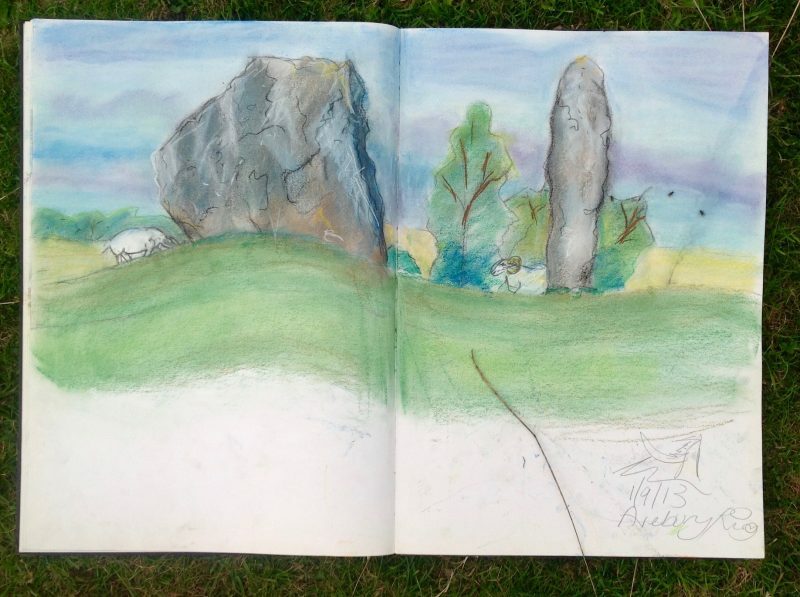 My recent visit to Callanish brought back memories of Avebury, the pretty Wiltshire village I would visit with my sketchbook. We’re coming up for the summer solstice so I expect the village to be teaming later this week. 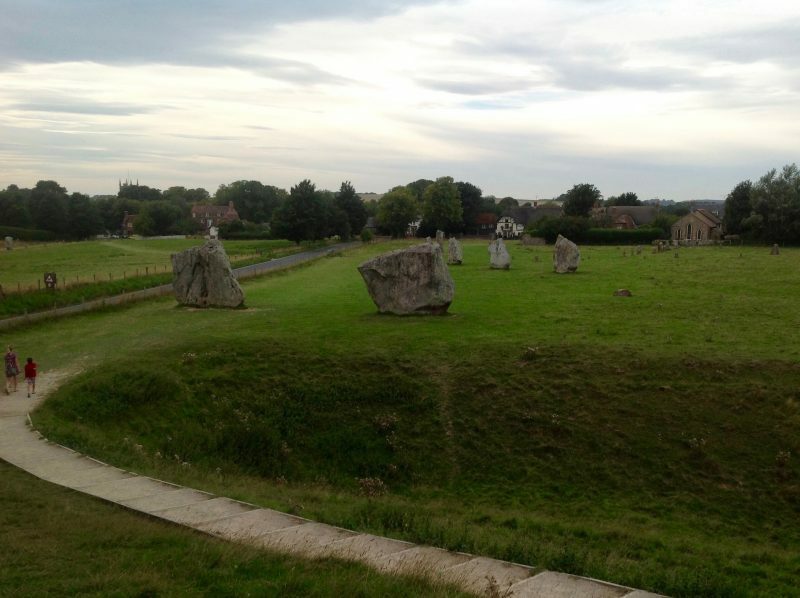 I discovered the village of Avebury in the ’90s and enjoyed escaping there when I lived in London. It was an easy place to get to for me since I could be here before lunch and stay for the summer sunset. And see the bus back to the station coming from outside the pub! In a word, it’s magical. The village itself grew around the stone circle so there’s a wonderful organic feel to it. In fact, to get from one part to another you need to cross a road which bisects the circle. The cheeky villagers harvested some of the stones to make their houses as the megaliths being part of Pagan Britain were unchristian. Looks like they had enough to build a church too! Like all good English villages it hosts the church and a great pub. 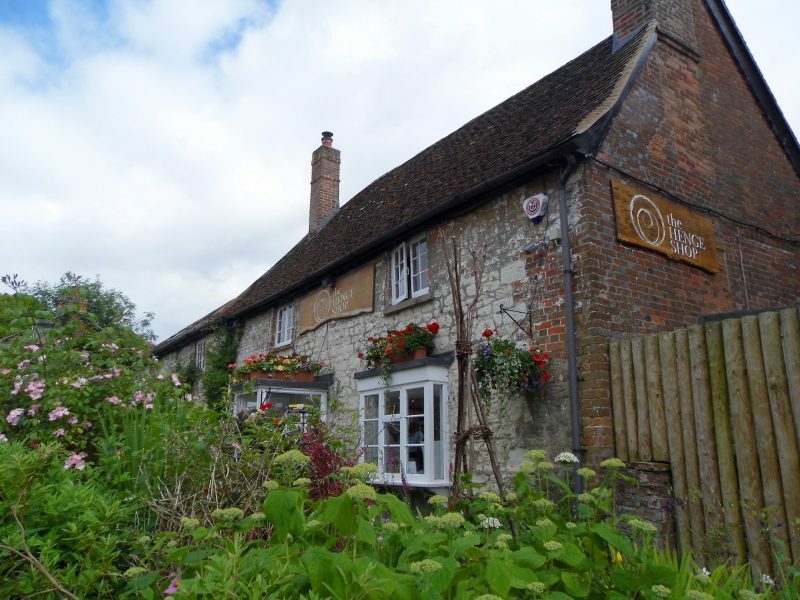 The Red Lion houses an ancient well with a thick glass plate over it so you won’t fall down (!). If you’re sitting at this table expect the odd north American tourist to pop over and read the spooky inscription about the last person to have plunged its depths. Aha! Took my time before I started speaking about art. And actually, should I even be calling it a circle? Apparently it’s really a square if you read this article on the BBC News site from a while back. 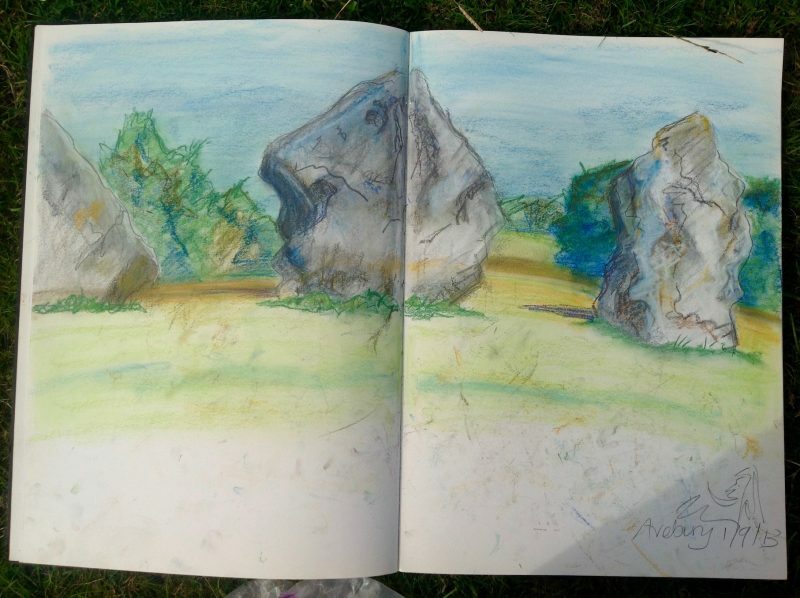 I did the drawings below on my last visit sketching in chalk pastel, easy to use and take out and about. And who doesn’t love colour? There’s plenty of colour in the stones, however grey they appear at first glance. Hints of blue, green and white. But I’m sure a geologist could speak more on their composition. Sketching is a great way to meet new folk. Plenty of children came to see my handiwork, many parents warning them not to disturb me. Although this is exactly what I was hoping for. Speaking to children about how they see and experience the world is important, especially if it gets them being creative too. Neither did the goat and the sheep, two of the least reliable life models I’ve ever worked with. They didn’t stand still for long, so I had to work quickly. The stones are huge as the following photos testify. And there are many questions about why they were placed in such arrangements. And not just once, but in circles all over north-western Europe. They’re generally accepted to be huge cosmic calendars which in turn link to the religious beliefs of the day. A more recent finding is that the type of stone itself has acoustic qualities that others don’t. Personally, I prefer Avebury Ring to the more renowned Stonehenge. It’s smaller and you can walk straight up to the stones. Plus there are the aforementioned animals at large, munching nonchalantly on grass and chilling out (see tree photo). 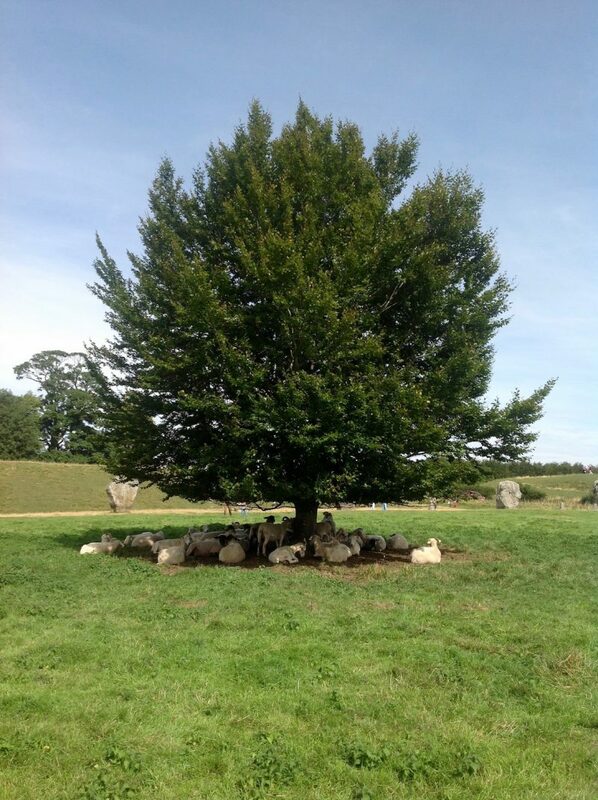 Avebury’s stone circle, surrounded as it is by people living their daily lives, is cosy, snug and cottagey. How wonderful it must be living here in the summer when the days starts early, getting up and strolling around the stones! Or seeing it in the winter under a blanket of snow. I’ve always wanted to spend a weekend here. I’d love to walk round the stones in an early morning mist. So a think a short stay is in the bag on my next trip down south. You’ll find Circles Cafe as you stoat about which does teas, coffees, cakes and soup. Avebury Manor Tea-room does a wider selection by the looks of things (and it’s a very nice tea-room!). And the aforementioned Red Lion also does pub lunches. It looks like any local eateries get quite busy when visitor numbers are high. Why not take a picnic, find a shady spot and share it with some of your new friends? You’ll find copious gift shops selling National Trust items and an assortment of good quality hippy paraphenalia – leyline ware, crystals, rainbow knitwear – as well as books and silver jewellery. I love the Henge Shop which has something for pagans and historians alike. You’ll also find a gift shop near the Circles Cafe which sells a good range of stone circle-related reads. But the biggest souvenir, for me at least, is the tranquility. Whenever I visited I felt the noise, stress and bustle of London melt away and seep out of my pores. 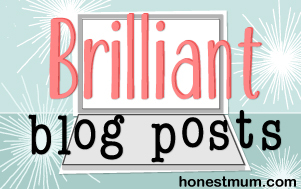 The hullaballoo of folk yelling, tyres screeching and the annoying voices in the the self-service tills at the supermarket disappeared. To be replaced by bleating sheep, braying goats and the odd tractor. The air is fresh and you can take big gulps of it. Then fall asleep in the grass. 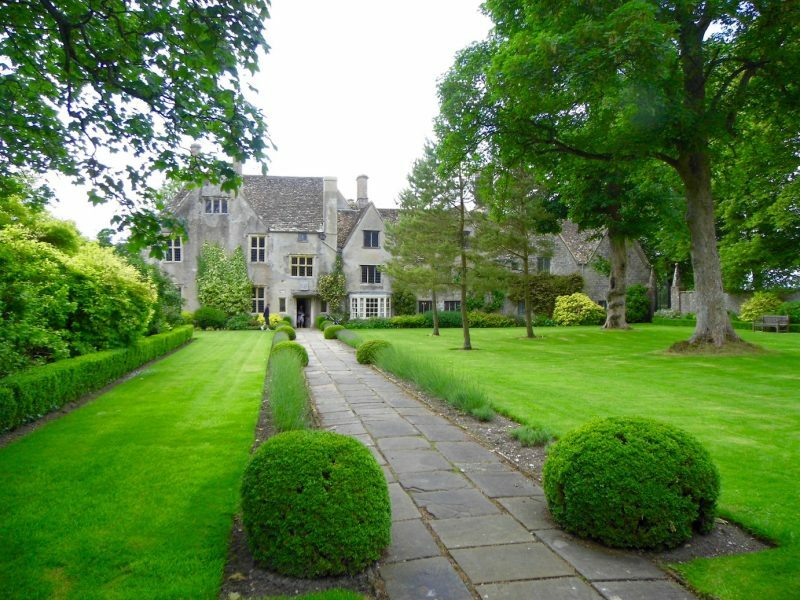 If country piles are more your thing then you can’t go wrong with a stoat around Avebury Manor (pictured below) wherein you’ll find the aforementioned tea-room. Various rooms have been refurbished in differing historical styles and there’s a walled garden. 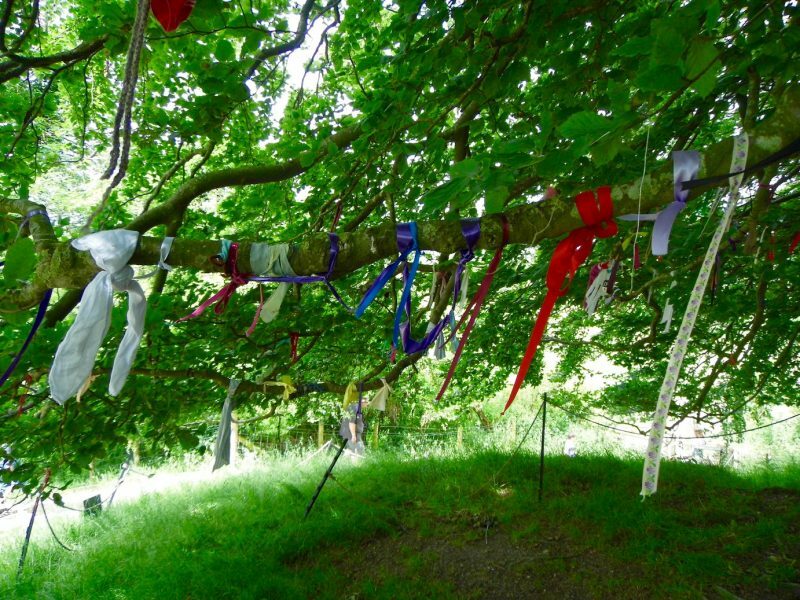 A walk along the path which encloses the village will take you past some wonderful trees with knotty roots. And who doesn’t love trees? 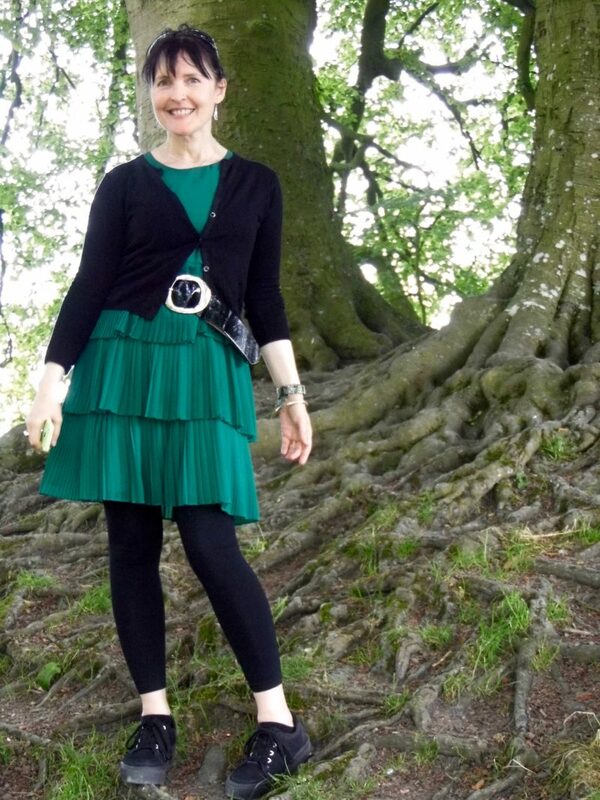 Here I am beside them in the photo below wearing one of my many green frocks. There’s also the nearby West Kennet Long Barrow and Silbury Hill which pre-date the stone circle and are well worth a stroll to as well. Walking shoes recommended! Avebury is tucked away in the Wiltshire countryside between Swindon and the wealthier town of Marlborough. It’s just over an hour’s drive west from London along the M4 motorway, then half an hour south of Swindon. 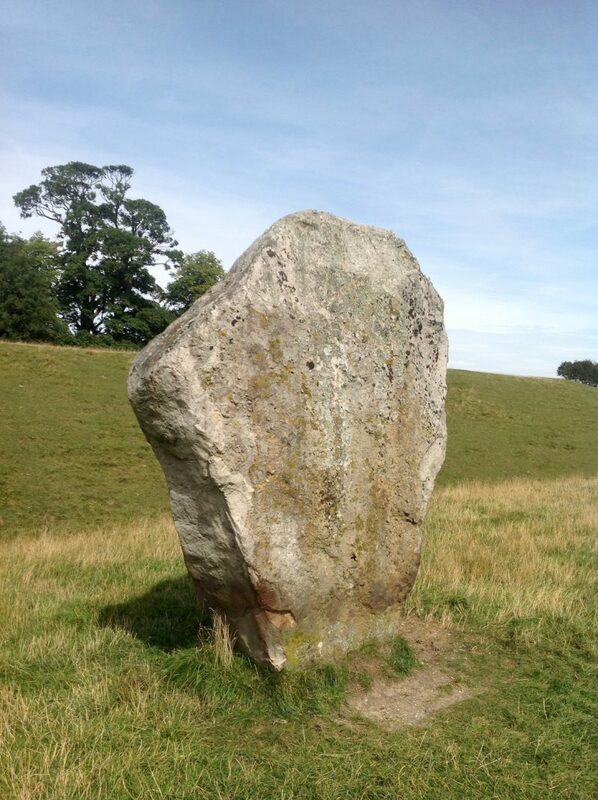 Getting to Avebury Ring is easy if you have a car, though they’ll sting you for parking. From London or the West Country: Take a train to Swindon then walk over to the bus station and pick up the 49 bus towards Marlborough. Ask the driver to drop you at the Red Lion pub. You’ll find plenty of other people getting out here and you’ll be straight in the heart of the village. Getting back into Swindon is easy. Just wait for the bus as you sit outside with a pint. Last one’s around 7pm. If you’d prefer the coach why not go to Marlborough, a charming town itself? Hop on the 49 bus going towards Swindon and follow the hippies! Can’t wait for my next visit. Where do you like to escape to? 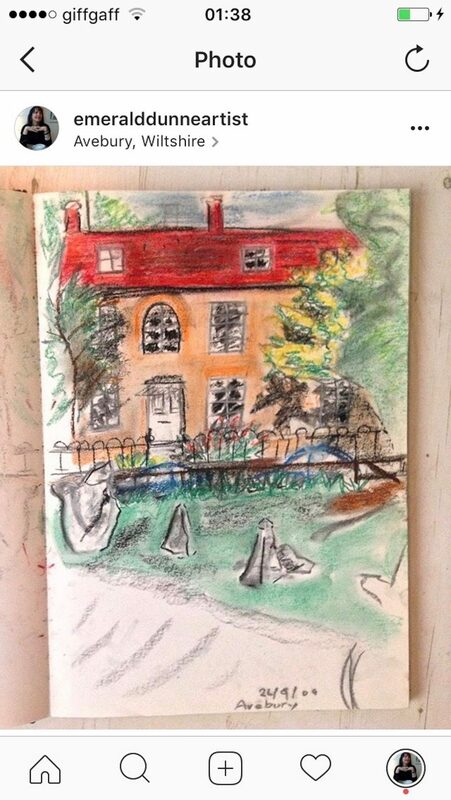 "Ullapool: A night and a day"
"Midsummer: Adventures with my sketchbook"